On our roofs we go the extra mile. we weave our shingles to give it one more layer of protection! No Leaking Valleys On This House! 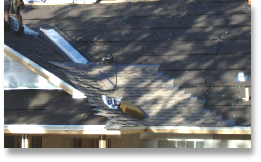 SHINGLE ROOFING - A good roof in one of the most important parts of your house. What's the old saying "you need a roof over your head". The most common type of roofing is a Shingle roof. Shingles come in many shapes and sizes, so we will have to talk about what's right for you. 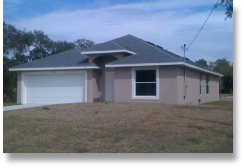 In our central Florida climate you can expect an inexpensive shingle roof to last anywhere from 10 to 15 years. With a higher grade shingle you can expect it to last about 20 years. Even though you buy a "30 year shingle" with Florida's tough climate you will most likely never get 30 years from a shingled roof. 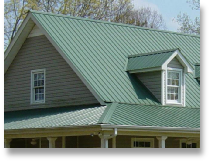 METAL ROOFING - When you looking for longevity you have to think Metal. A good steel roof is designed to last 50 years, and with some maintenance can last much longer. 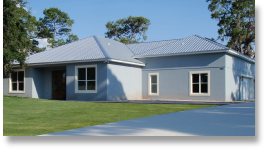 Metal roofs also come in many shapes and sizes so we would have to go over your options. 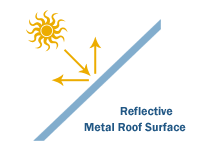 You can expect to pay about 2 to 3 times more for a metal roof than a shingled roof. 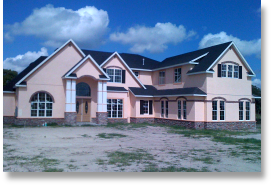 Steel roofs, depending on the color and style, come with tax credits and some are Energy Star rated to help with the energy efficiency of your home.